Blog » Is it Plagiarism or Not? As you read the scenario, see if you can tell whether or not it is plagiarism before reading the verdict. 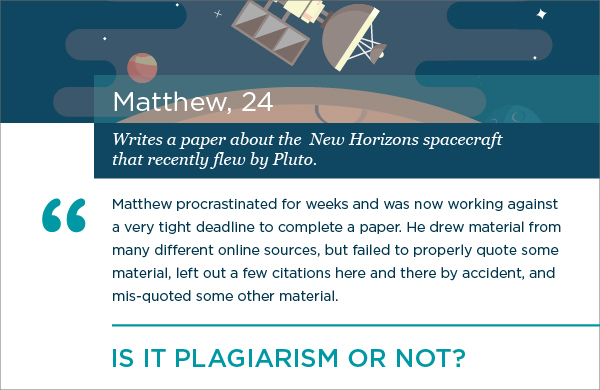 Understanding the different kinds of plagiarism and how to avoid them is essential for academic success and, as the old saying goes, practice makes perfect. Yes, Matthew committed plagiarism. The most important thing to keep in mind from this scenario is that when you have to complete an assignment at the last minute, for whatever reason, you’re bound to make mistakes, and your instructors might view those mistakes as plagiarism even if you didn’t mean to do it.